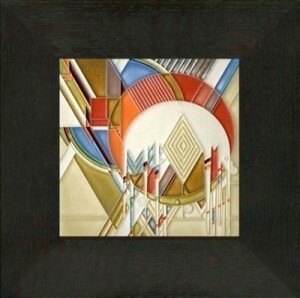 This new 8" x 8" tile by Motawi Tileworks sure to be a big hit with Frank Lloyd Wright collectors! Available as shown: framed in our own handmade quartersawn white oak Legacy style 3" wide beveled frame with Dard Hunter Studio's Ebony finish; or in your choice of other framing options shown below. NOW FROM DARD HUNTER STUDIOS: Select one of 3 color choices for our hand applied finish at no additional charge! All three look fantastic with tiles by Motawi Tileworks.